Nothing rejuvenates both the mind and the body like taking an adventurous trip through the heart of our Mother Nature. Heading into the blue yonder (or wilderness) with your loved ones comes with a lot of shopping plans, and you’ll need to load up with the right supplies and utilities. Speaking of the right utilities, instant camping tents are worth the outdoor experience whether you are a pro or a beginner. They come with pre-installed frames, which makes it easy to set it up. This also means they are ideally suited to provide you and your family the comfort and convenience of a home base with a reliable coverage from the sun, winds, bugs and other dangerous outdoor elements. Besides, they don’t need much space and time for set up. So, if you’re planning to spend your spring, fall, or summer season camping, an instant camping tent is something worth looking into. At the end of this article you can read what things to consider when shopping for the best instant tents for camping. Thinking of getting a lightweight 1-person instant tent for your next camping trip, then you may want to check out the Teton Sports Outfitter XXL Quick Tent. With a setup dimension of 82″ x 39″ x 32″, this Teton Sports tent feels very spacious for a single occupant. It features a side-entry door for easy access, as well as an in-built vestibule to keep water (rain) off your sleeping bag. This 1-person tent weighs just (4.3lbs) and takes less than a minute to set up. It can also be set-up on an oversized cot, but it is more stable when set-up on the XXL cot. This freestanding tent is made of rugged taffeta fabric with a water-resistant and flame retardant coating to keep you safe from the harsh weather, through most seasons. The tent bottom (floor) is sturdy enough and attaches securely to all extra-large cots using the four loop and toggle bungee attachments. The micro mesh inner tent is also designed for excellent ventilation to keep you breathing even in hot environments. Ideal for backpackers and hikers, thanks to its compact packed size. 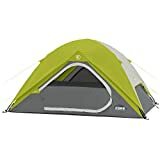 If you are not concerned about weight and you are looking for a no-frills, but an all-inclusive tent, Teton Sports Mountain Tent is the best instant tent for you, it comes with everything you would ever need to set up camp which includes: rain fly, inner tent, footprint, stakes, and poles. The tent is designed with a heavily coated floor which prevents items on the floor from getting wet as a result of both external and internal condensation. The mesh inner tent allows for a 3600 view of the wilderness, while the rainfly serves as an insulating layer in cooler days. 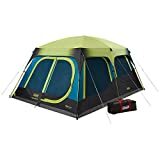 The design of the tent also allows for the ease of assembling the tent as there is one interlocking pole and easy to use durable clips to attach the rainfly. 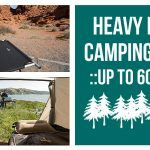 Mountain Ultra-tents comes with different size, weight and carrying capacity, Mountain Ultra 2 has a size of 82.5″ x 63″ x 45″, weight of 5.25 lbs and a capacity of two persons, Mountain Ultra 3 has a size of 90″ x 78″ x 49″, weight of 6.5 lbs and a capacity of three persons, Mountain Ultra 4 has size of 98″ x 83″ x 59″, weight of 7.4 lbs and capacity of four persons also available is the Mountain Ultra 1 which as a capacity of one person. Mountain Ultra tents are ideal for a car camping trips, or backpacking trips that require a sturdy tent to hold up through wind or rain. When looking for a quality tent you’ll want something that is very reliable and sturdy. You may also need something that is just as easy to set up and take down. If that’s case, then this hydraulic outdoor waterproof tent from Night Cat may be your best option. Night Cat’s fully waterproof tent can accommodate up to 3 occupants (or 4 if needed) and still be carried around easily as a backpacking tent as it weighs just 3.5kg (7.8 lbs). This family tent operates through the hydraulic pressure mechanism that makes setting-up and take-down very easy. What’s amazing about this tent is the 190T PET rainfly fabric and 210D Oxford inner tent and floor fabric that has been treated with waterproofing spray rate at 200mm, hence you don’t have to worry about heavy downpours. Added to the 210 x 180 x 120cm spacious accommodation, is a well-built mesh cot for maximum air-flow in and out of the tent for reliable ventilation through all types of weather. The tent is also designed with a waterproof base and sturdy structure to make it ideal for different camping grounds. 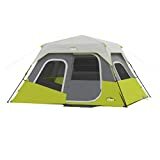 Night Cat’s pop-up tent is the best option whether you are getting ready for your next weekend camping trip or simply as a tent you can put in your backyard where your kids can sleep under the stars. If you’re into hiking, backpacking, and camping, then the Abo Tech pop-up tent might be your ideal portable shelter. 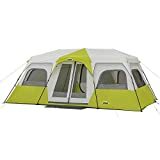 This tent is popular among campers for its lightweight and spacious internal size that could accommodate up to 2 adults. The internal size is perfect at 37.4” Height x 88.6” Length x 47.2” Width. Its pop-up design makes setting up and take-down easy, which means it’s a ready-to-use and can easily fold into a compact size for easy portability. Whether you want to go camping with your boys or girls, the effortless set-up is preferable for everyone. Away from the pop-up functionality, the tent is made from a solid nylon fabric with a UV protection rating of UV30+, which makes it ideal for the summer season. The fabric is also water-resistant with a breathable design for reliable ventilation. The heavy-duty design is also another benefiting factor that assures you of a durable portable shelter. For complete privacy and extra security, the tent is built with a double layered door. The fabric also has strong stitching at the seam to avoid rips and tears. This CORE 4 person instant tent is a perfect choice if you are looking for a lightweight shelter that can be set up and ready in 30 seconds! This is a spacious, waterproof outdoor tent that can accommodate up to 4 persons and still offers the much-appreciated instant set-up design. Its spacious room (you can fit queen air mattress) and stable frame offers a comfortable and secure space for the occupants. The fiberglass frame contributes a lot towards making the tent sturdy and very reliable in windy weather. The CORE 4 is made of a water-repellent fabric with Core H20 block technology and adjustable ground vent. With an internal space of 108 x 84 x 54 inch, it true it can comfortably accommodate 3-4 adults. Setting it up and taking it down is quick and easy, in just about 30 seconds. With pre-attached poles all you need to do is unpack – unfold – extend and you are good to go! If you would love to bring your kids along for a camping adventure, Coleman 4 person instant tent is definitely the tent for you. 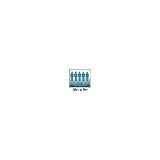 It is easy to set up thus saving you enough time you would use to spend with your family. Besides, those heavy downpours won’t be a problem as the tent is perfectly waterproof and you can also enjoy looking out at the stars through the illumine guy lines that provide great visibility at night. It’s all about offering you that comfortable night shelter. The most amazing features about this Coleman instant tent include; welded floors and inverted seams to help keep water out, built-in vented rainfly for weather protection, inner storage pockets to keep your gears and gadgets (like phones) organized, poly guard 2X fabric which keeps water from seeping into the tent, three large windows that helps with the tent’s ventilation and it is also very spacious with an internal dimension of 38 by 18 by 9.5 inches to avoid crowding. Mostly suitable for small families – it’s easy to set-up design proves helpful as it can be erected by anyone in the family, irrespective of the age. Its spacious interior enables the kids to move around without feeling restricted. Are you considering taking your family (including the family pet) for camping? Well, the AyAmaya option might be the best instant tent for you. It is designed with a hydraulic automatic setup for quick setup and provides enough room (at an internal size of 80.7 X 78.7 X 47) for the whole family to fit comfortably. It has windows on each side for ventilation and an amazing view of the beautiful scenery. Other great features of the AyAmaya instant 4 person tent worth noting include; the automatic set up that takes a few seconds and is stress free, the mesh windows for proper ventilation and privacy, the 4000MM waterproof PU-Coated Oxford groundsheet and 3000MM waterproof PU-Coated Polyester fabric roof which protects you from bad weather and rain, and then there’re s inbuilt pockets for keeping phones, GPS and other essentials gear for convenience. The CORE 6-person instant cabin tent is another popular model of instant tents that can accommodate up to 6 adults, with a floor dimension of 11′ x 9′ (around 99 sq.ft.). 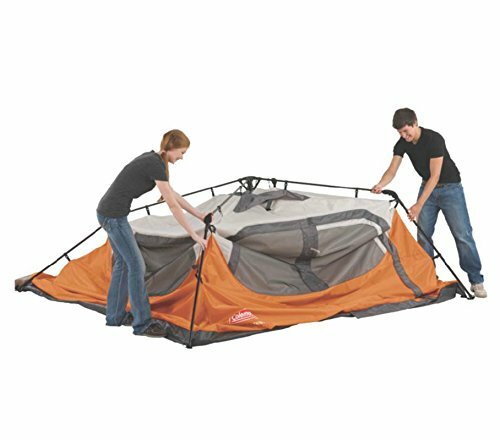 This tent has pre-attached poles that make setting it up a breeze. 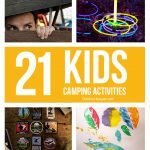 It can set up in a record time of 60 seconds and this why among other things this is our pick for the best instant family tent! 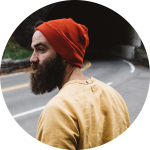 The erected dome shape give it a center height of 72-inches (6 foot), which makes it a convenient option for tall people. Unlike most models, it uses the value CORE H20 Block Technology that merges fabric with active bead technology for better waterproofing properties. Besides, both the doors and windows have waterproof seals along with the sealed seams to make this an ideal tent for the rainy/wet season. The rainfly is also fully tapped. In addition to water-resistant seals, the fabric is heavy duty polyethylene that is waterproof and can handle the high traffic with tearing. The CORE 6-person instant tent also has gear loft as well as large wall pockets used to keep all your outdoor gears organized. You could also hand a lantern or lights on the lantern hook. It is also fitted with an electrical cord access port that allows you to bring power inside the tent. I love when a tent is made as an upgrade of the previous one because the company gets to improve on the imperfect predecessor. And that’s what Coleman did to come up with this 6-person instant tent. The Coleman 4-person tent is an ideal instant tent for camper but the poor livability tends to hold many people from it. As a result, the Coleman 6-person instant tent has been designed to offer more space and still keep the essential features. Just like the 4-person tent, it has been designed on pre-attached poles that make set up and take down quick and easy, in just 60 seconds. It also features the same rugged and durable 150-denier polyester fabric to protect you and your family against bad weather conditions. As part of it livability improvements, the tent features the WeatherTec system, a new technology to protect you from the rain. Then there’s the 10 x 9 feet (90 sq.ft.) floor dimension that takes the livability improvements further, making the tent more spacious and convenient for your family. I bet you’ll also love the 71”center height. Thinking of a cabin style instant tent, then you may want to check out the Ozark 6-person instant cabin tent that comes with the new darkroom technology to create a cool atmosphere for all occupants during the day. Most campers find it an ideal portable shelter for hot climates. With the pre-attached poles, set up and fold back is quick and easy in just 60 seconds. You just have to unfold and extend the four main poles into a 10 x 9 feet instant tent. At 10 x 9 feet, the cabin style design becomes more vibrant with three large windows for great outdoor views, a spacious door for easy access and a comfortable space that easily fits 2 queen airbeds to accommodate up to 6 adults in sleeping bags. Seasons-wise, the Ozark Trail 6-Person instant cabin tent is ideally suited for summer camping. You can also keep your camping gear organized with large gear organizer and hanging gear loft. In love with our runner-up Coleman’s 6-person instant cabin shelter but still, need a better protection from the rain? Well, the Coleman 6-person instant cabin tent with fly may be what you’re looking for. 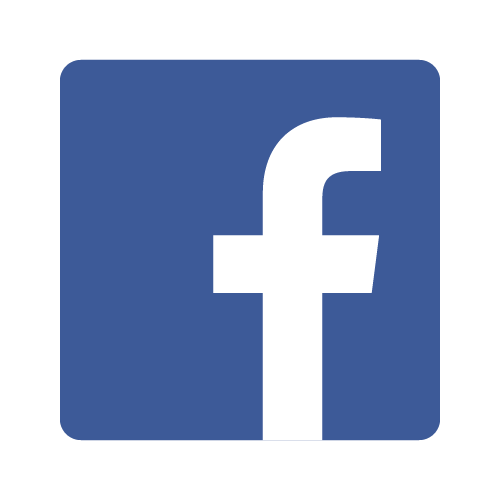 It’s an ideal option for those who don’t want to get involved in a complicated bunch of pole and confusing setup and take down moments. It, therefore, features a preassembled frame that assures you easy setup and folding. This tent is also lighter and more compact compared to other models, which makes it a perfect option for hikers and backpacker. The living space is similar to that of the Coleman Waterproof 6-Person Tent at a floor dimension of 10 x 9 feet (90 sq.ft.). To ensure you have better protection, Coleman added a rain fly to the exclusive WeatherTec system. The interior pockets are also waterproof to keep your gears dry through the wet weather conditions. The CORE 9-person instant cabin tent is another great portable shelter for families or large groups. It combines a lot for features that every ordinary camper will find ideal for the great outdoors. The right choice if you are thinking of carrying two queen-sized air mattress. 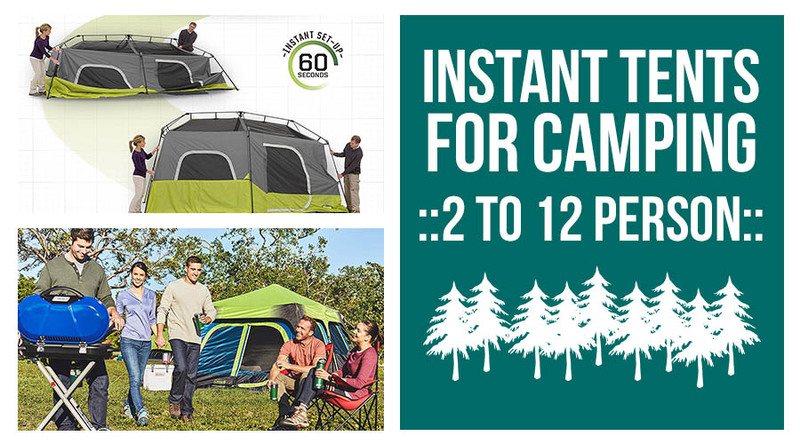 This instant family tent is huge and purposefully designed to offer extra space to camping families or groups. With a floor dimension of 14 x 9 feet (136 sq.ft.) and a center height of 78”, you don’t have to crawl inside the tent. For extra privacy, it features a room divider that you can use to install boundaries within the tent. To ensure you’re fully protected from the rain, the tent features a rainfly besides having been made from a water repellant fabric. The fabric is reinforced by with the active bead technology to ensure the runoff doesn’t penetrate inside the tent. As for installation, the tent comes with pre-assembled frames that are pre-attached to the fabric for easy setup and folding. You can also bring electricity into your tent, thanks to the electrical cord access port. At a floor dimension of 14 ft. x 10 feet (140 sq.ft. ), the Coleman 8-person instant tent makes it to our list as an instant family tent. 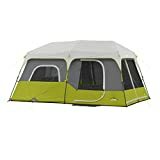 According to Coleman, this tent is very spacious and can accommodate up to 4 queen-size airbeds and still leave enough space for occupants to carry out their indoor’ activities. This tent’s design ideally suited for most environments, whether it is in the savanna, jungle, woodlands temperate areas or on the beach. The build quality and Coleman’s signature WeatherTec system speaks more about the tent’s suitability for bad weather. It is made from a rugged double-thick fabric that can withstand harsh conditions. Besides, it features a tub floor with welded corners, covered zippers, protected seams, and an integrated rainfly for an amazing performance in wet conditions. For additional privacy, it comes with a room divider that can divide the inner space into up to 4 sections. You don’t have to worry about installation as it comes with pre-attached poles for easy setup. You’ll also benefit from the storage pockets. For more than a decade, Coleman has been offering a fantastically diverse range of outdoor gears, and their line of tents has a lot to do with major revolutions in the outdoor shelter industry. The Coleman 10-person instant cabin tent is another worthy addition in the company’s line of outdoor tents. It’s ideal for larger camping families. With a floor dimension of 4 ft. X 10 ft. and a center height of 6 ft. 7 in., the tent is suited for your family’s or group’s outdoor goals. It can comfortably accommodate up to 4 queens size airbeds, with enough space for occupants to keep their gears. The strong frame and heavy-duty fabric have been confirmed to withstand 35+ mph winds, making the tent ideal for most seasons. The frame consists of pre-attached poles that make set up and take down easy, in just about 60 seconds. For more convenience, the tent comes with a dark room technology capable of blocking 90% of the sunlight so the occupants can comfortably sleep or rest past the sunrise. The dark room technology is also meant to reduce the temperatures inside the tent for that comfortable night sleep. This Coleman large instant tent also includes the company’s preferred features such as the WeatherTec system, tub-like floor, protected seams, patented corner welds, and more. This is a great 10-person instant tent has for a long time qualified as an ideal freestanding family camping shelter. It is one of the most preferred tents with an excellent capacity, which makes it suitable for camping groups and families. 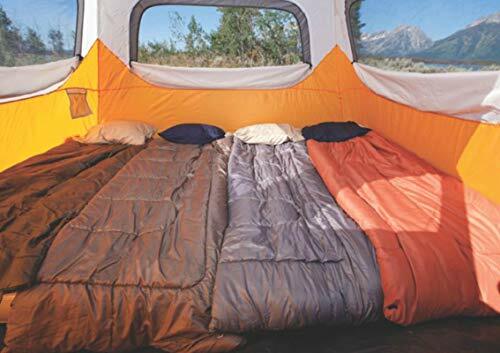 With a floor dimension of 14 ft. x 10 ft. and a center height of 78 inches, the Ozark Trail 10-person tent offers enough space that can house up to 4 queen size airbed. Being a very spacious tent, it comes with a room divider that can divide the space into 2 rooms for convenience. The most amazing feature about this tent is the innovative dark rest technology that is meant to assure occupants of an unsurpassed level of privacy and comfort when sleeping or resting past the sunrise. There’s also the rainfly with fully-sealed seams to protect occupants from the wet weather conditions. Are you looking for a very spacious outdoor shelter that could accommodate your wider family in under one roof? Well, the CORE 12-person instant tent might be what you’re looking for. Just like most instant tents from CORE, it comes with several special features that could make your life in the wilderness enjoyable. It is very similar to the common CORE 6-person instant cabin tent and features the highly valued CORE H20 Block technology. This tent’s livability is very outstanding as it offers a floor dimension of 18′ x 10′ (180 sq.ft.) and a center height of 80”, which fits 3 queen size air mattresses/beds. It also comes with dividers that can be used to organize the vast space into three spacious rooms for privacy and convenience. Away from its great waterproof rating, the windows, and a huge mesh roof are responsible for a magnificent ventilation system. You also have an electrical cord access port to power your tent. Standing with floor dimension of 16 x 16-Feet, the Ozark Trail 12-person instant cabin tent offers enough room for large camping families. Designed with Ozark’s highly-valued features, this tent makes an ideal outdoor shelter for every outdoor enthusiast. This large instant tent has 3 rooms that are fully fitted with large doors and windows for easy access and proper ventilation. The rooms are also spacious enough to accommodate queen size airbeds and still leave more space for the occupants’ convenience. The pre-attached poles are meant to make installation and folding a breeze. The instant tent is also made of the highly durable 68D-coated polyester fabric to ensure you have a long lasting outdoor shelter to protect your family from rain and bad weather. You can also use the electrical cord access port to bring electricity into the tent. Although most campers love instant tents for their pre-attached poles that means they can be pitched on to the camping ground within no time, there’s still more to these tents. The first step is to find spacious tents that would accommodate the intended number of occupants. Whether you want a tent for a single occupant or one with additional space for family, extra friends, pets or gear, there’s always a variety to choose from based on size. Our general advice when evaluating tent capacity ratings, get something that offers enough room without resulting in a crowding effect. The tents’ capacity is upsized by 1 person, and this helps you decide if you or your tent mate(s) are claustrophobic, large people, bringing a child or a dog, always sleeping with more than the average elbow room, and prone to toss and turn at night. What’s more, get one that offers you enough space that you find convenient for your needs. The tent’s quality of material speaks volume about its durability, weight, versatility, and reliability in different weather conditions (seasonality). For sure, the material quality can make a big difference in your level of comfort your tent offers. When you’re shopping, you should understand that higher-denier fabric rain-flies and canopies are more rugged than the lower-denier ones. Besides, higher-denier and seam tape fabric on tent floors tend to lower the odds of leakage. When evaluating the fabric quality, our general advice is this: something light like polyester would serve you well in the summer, but a four season tent you’ll need something more durable like nylon. Instant tents levels of comfort go beyond how well it protects you from the hard ground and how spacious it may be. You’ll have to consider more factors to ensure you get something that is ideally suited for your needs. Basing your interests, consider the quality of fabric, padded floor thickness, tent size, capacity and how convenient is it to do your favorite activities. It would be better if tents are right for all seasons, but a good number of them are for a single season only. These are usually designed for the 1-2 season and are meant to keep you cool. They have a thin layer of waterproof coating (or covering) and can only withstand mild rainfall. These tents are often the best option for casual campers and are very affordable. These can endure different climatic conditions, often doing well in summer, spring and fall. They mostly come with rain-flies and other desirable features that can endure the strong winds, moderate rainfall, heat, springs, and even mild snowfall. Their main goal is to offer the right balance of strength, ventilation and warmth-retention. Their sturdy design makes them a great choice for campers who visit exposed, high-elevation areas. They are slightly expensive than the summer tents. These are designed for extreme weather and violently cold areas. They have better insulation and other desirable features to suit all season. Though you’ll have to digger deeper into your pockets to get one, they are worth the investment. Though instant tents are popular because of their quick and easy setup, different models come with different features and setup designs. Depending on what model you plan on getting, you never settle for a tent that takes you more than 20 minutes to set up. You should also make sure the doors large enough for easy entry and are zippered for convenience. The tent’s ventilation depends on the design and number of ventilation vents available for maximum airflow and better condensation. Therefore, depending on your camping season you’ll need to make the right choice when shopping. There are two instant tent styles available today – Dome style and Cabin style tents. The dome style tents are self-supporting (freestanding) and their structural design doesn’t need guy line to keep them upright. They are designed with sloppy walls and have an extra pole to support every the tent. Their characteristic dome shape and extra support make them the best choice for rocky, cliffy terrains. On the other hand, cabin style tents are vertical with peak height ranging between 6ft and 8ft and come with multiple windows. They are more spacious (compared to dome tents) and are more suited for single-location camping than backpacking. Besides, they are very heavy and built to last. The tent’s portability depends on its packed weight and size. Though most instant tents are designed to collapse on lightweight, compact size packages, you’ll still need to sort through the different models to find a more portable solution for your camping trips. The best tents come in carrying bags for easy portability. There’s no specific design manual for tent manufacturers should follow, meaning different tents will come with different features to suit different needs. 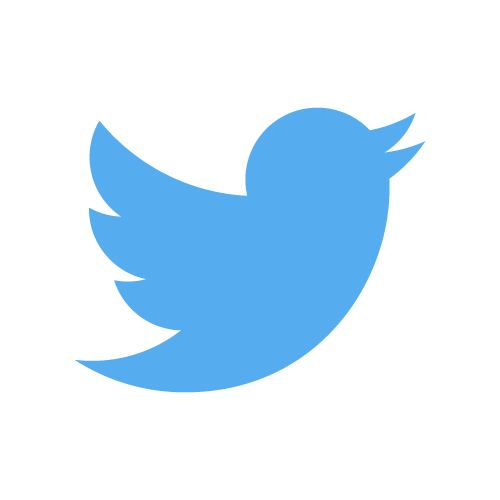 In that line, here are some special features you should know about. Layout (vestibule): Some tents come with additional shelter(s) attached to the main tent. They offer additional space and storage. Rainflies: every tent is today designed with a separate waterproof cover to protect the tent from rain and still retain some extra warmth. The number and size of the tent doors is another feature that may vary from person to person. Waterproof rating: since camping is often associated with unpredictable weather conditions, you’ll need a waterproof tent to keep you safe from the great outdoor uncertainties. E ports: these are meant to help you bring electrical power into the tent. Darkroom technology: most tents are today designed with the darkroom technology to offer the best level of privacy and block the sunlight from penetrating into the tent. Guyout loops: higher-quality tents come with loops on the outside for attaching guy line to allow you to batten down the hatches during high winds. Besides finding the best instant tent that not only suits your interests, you’ll also need it to fit your budget quite well.